The SOTA Water Ozonator is portable as it operates using 12 Volts. Ozone output is greater than 200 mg/Hr. We can all benefit from more oxygen. Oxygen makes us feel more alert. As a result of environmental pollution, there is less oxygen in our air and water today. Ozone, freshly added to drinking water, provides a safe and gentle increase in oxygen. The Water Ozonator can also be used to sterilize water. As nature’s cleanser, ozone purifies our air, soil and water. Ozone has become a well-known source for sterilizing water systems and bottled water. Laboratory testing using a SOTA unit to sterilize water, proved several virulent pathogens were killed. The Water Ozonator can be a handy item when traveling or camping as it can be operated from a 12-Volt battery. 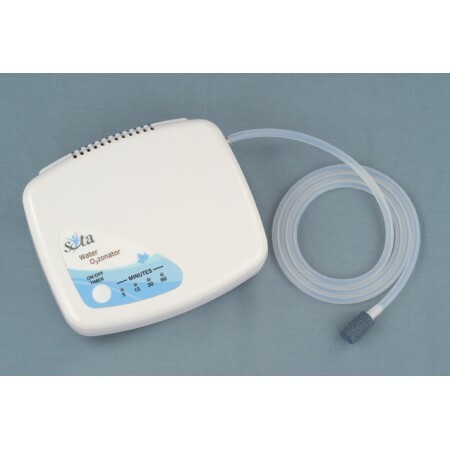 Check the laboratory tests for the ability of ozone as produced by a SOTA Water Ozonator to kill virulent pathogens in water. We stock Wall Adaptors with blades for North America, Asia, UK, Europe and Australia. Please specify the type of blade required when ordering.